The potting bench holds some of the plastic dinnerware I’ll be using this summer. All I can say is…. IT’S NOT YOUR MAMA’S PLASTIC! 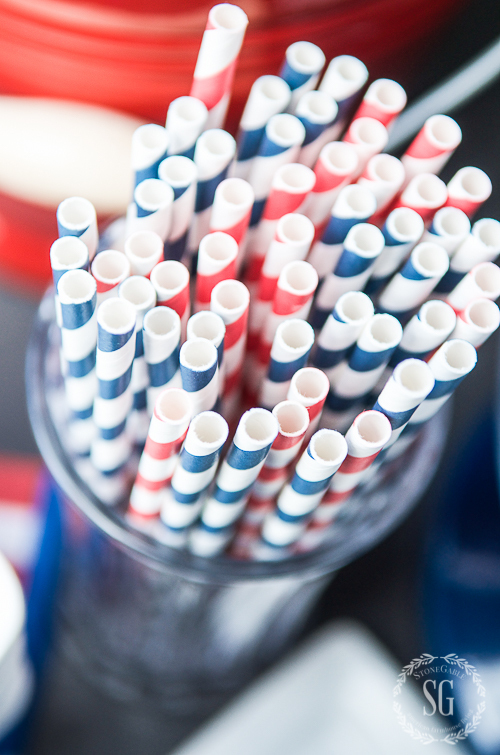 Plasticware can be found in so many fabulous styles and perfect patterns. And they can be found at the most reasonable price point! A few years ago I purchased these square white non-breakable plates. I’ve love love love them! They are sturdy, lightweight and easy to clean. And they won’t break if dropped! What could be better!!!! I like white plates. They show off food the best and work with any other pattern and color. Versatile, good-looking and perfect for outdoor dining! I also got these white plastic bowls at the same time. They are a perfect salad bowl! If you are thinking of plasticware make sure to get a deep bowl. They hold anything from soup to ice cream! I used my white plates and deep bowls for several years! Everything else on my outdoor tables was breakable! But, this year I got smart! I’m in the process of collecting great plasticware. There is outstanding plasticware on the market these days!!!! 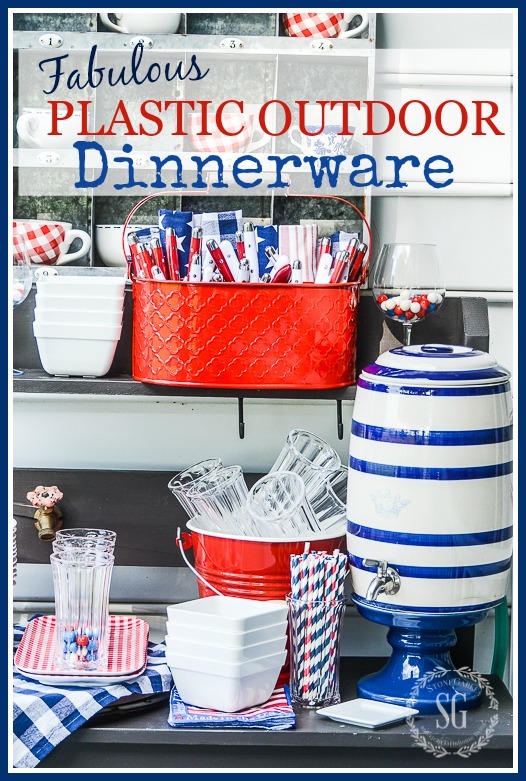 I could start a whole other dish collection… OUTDOOR DINNERWARE! I’m going patriotic this year! 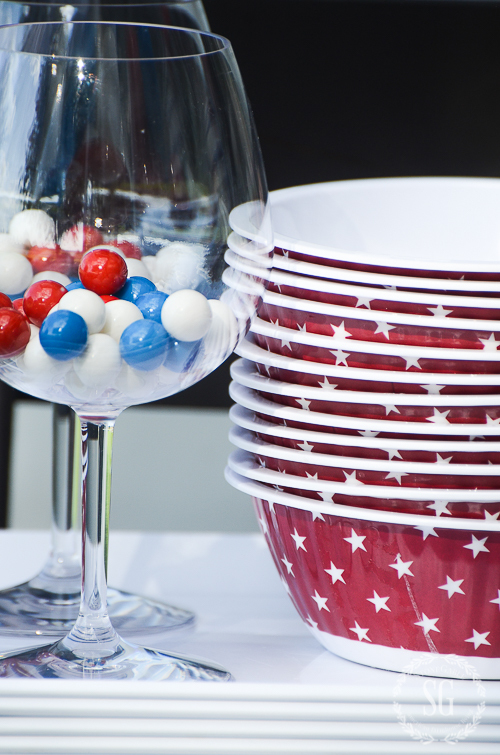 Aren’t these red star bowls adorable? They will be perfect for desserts and small side dishes. I had a hard time picking out drinkware! There is so much to choose from! I finally decided on a classic soda fountain tall tumbler… non-breakable, of course! They are heavy and well made and were very reasonably priced! Plastic wine glasses? Yes! I’ll be using them for berry crisps, trifle and other fun food too! 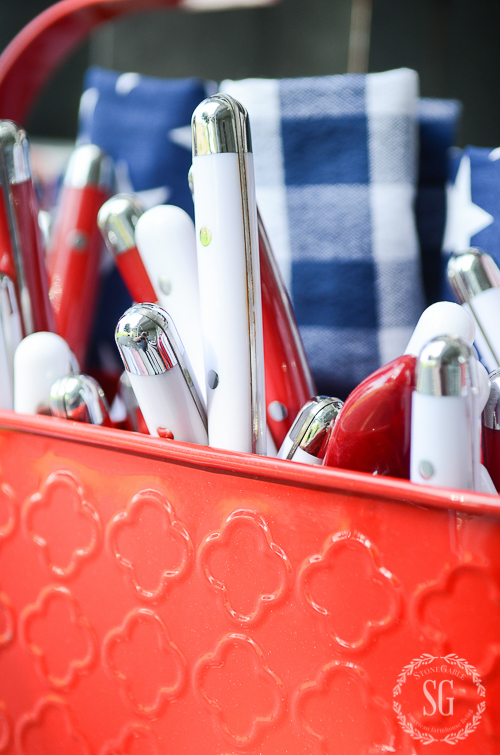 To make carrying utensils to the table easier I found this bright red caddy! 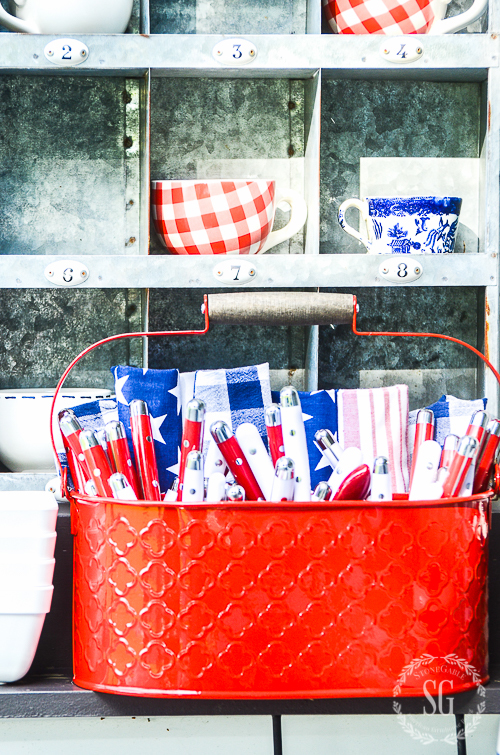 It makes taking the red and white handled flatware and the patriotic napkins outside! I must admit I love cloth dinner napkins! But, I’m all about cute paper cocktail napkins too. And I making a simple red bucket into a serving dish! I’m thinking salad will taste even better when served from this happy container! Creative, fun, functional and fabulous! How about you? Have you gone plastic? 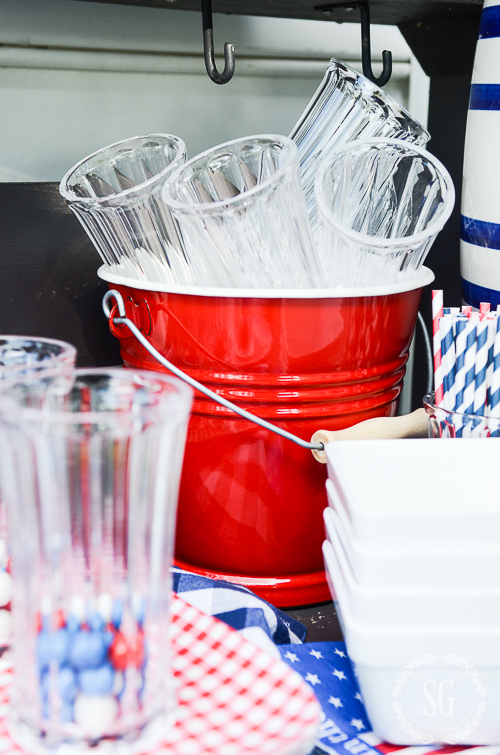 What is your favorite outdoor piece of dinnerware? You might like to follow me on Pinterest and see what I’m finding to pin daily HERE. 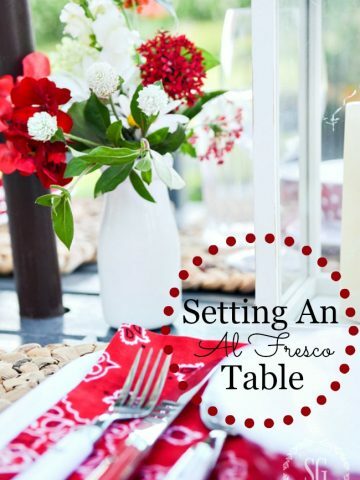 EASY RED AND WHITE OUTDOOR TABLE…FARMHOUSE STYLE! 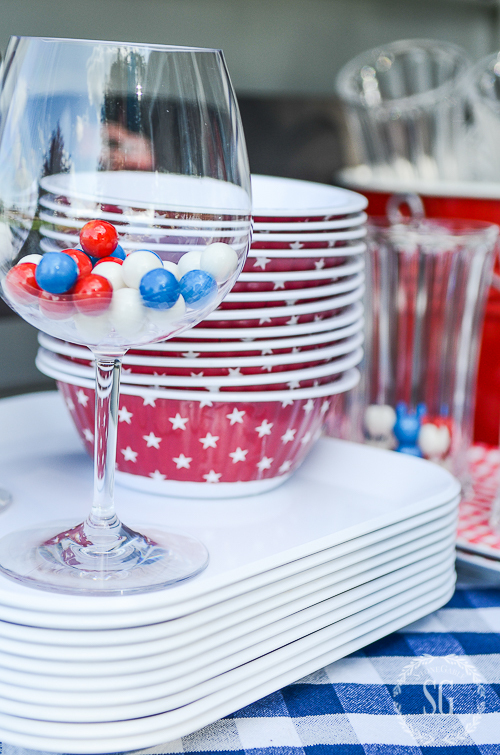 Not sure how I missed this blog post earlier..but I have also converted to plastic dishes for outdoor use…and I picked up some fabulous designs from Sur La Table….great patriotic pattern at the end of July last year…plates, bowls, serving platters. etc. 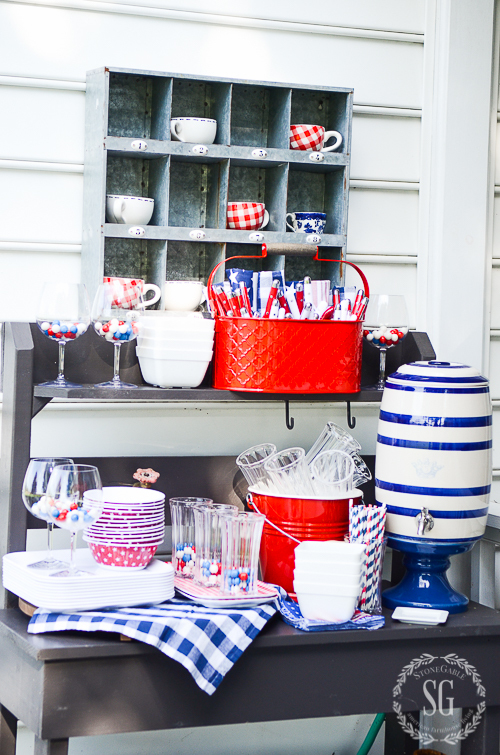 All were 75% off and I am going back to pick up a few more to fill out my table…Great suggestion on the red white and blue theme…I am using it year round by pulling certain pieces and pairing it with others that I have. Perfect for outdoor parties when I don’t want anything to break!! Oh, you are so right, the new melamine is not your Momma’s plastic dishes. And, I have 3 sets of it and love them all. I got all of mine at fantastic pricing and love it. Great post! I love the idea of using plastic. My favorite new thing is to use the children’s sand bucket (with attached shovel) for some of my salads. I have use them for cole slaw, potato salad, carrot and celery sticks, silver ware and straws. You can find these really cheap at the Dollar Store, Dollar Tree or Deals…. Please join me in boycotting TARGET they are allowing transgender men to use the ladies room and dressing rooms in their stores. It is already working, over a million signed the boycott in the last week. Love your outdoor dinnerware., they do have so many cute dinnerware that is not breakable . No fair. You show us all this cute plasticware. Now please reveal where we can purchase our own. No Fair! You show all this cute plastic wear and don’t tell us where to find it. What are your sources, please? I see so many great melamine dishes now that I’ve decided to purchase some sets…so much easier than hauling out my breakables, and still have a pretty table setting. We too have gone with plastic for outdoors! Especially after breaking many a wine glass. So many great looking options available nowadays. Need to look into those tumblers. Your plastic dinnerware look so cute Yvonne! And I agree with you it’s perfect for picnics and dinner al fresco! 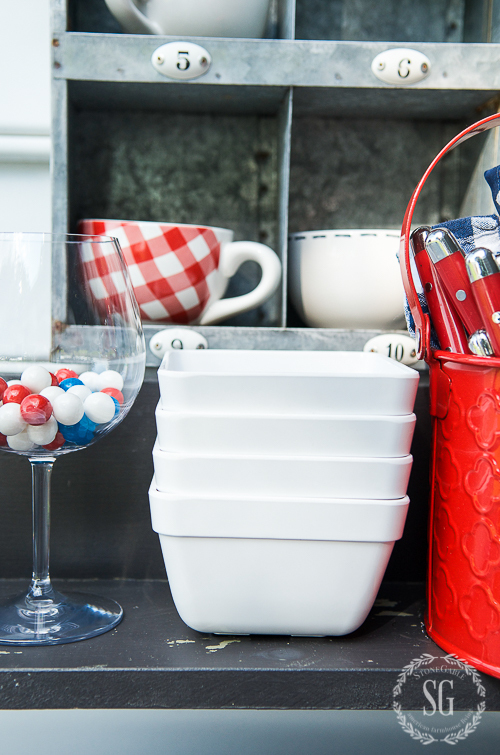 You are so right…it ain’t your mama’s plastic dinnerware!….Love the red, white and blue…so versatile for the summer months so beautifully displayed on your potting bench!!! 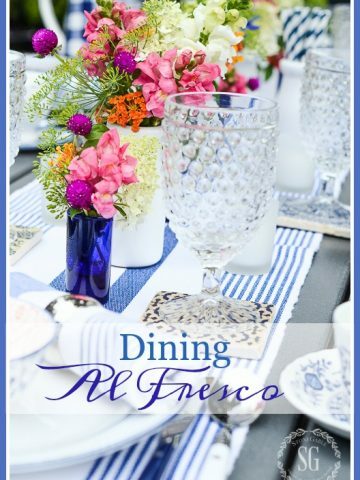 I went to HomeGoods the other day and saw so many beautiful melamine dishes….I had such a great stock of “plastic dinnerware” when I was in Florida entertaining most of the time by the pool….Have a fabulous weekend, hopefully spending it outdoors in beautiful weather! Looks so summery and fun!!! There is a lot of nice plasticware available now and it is so practical for outside, especially with a pool and small grandchildren. 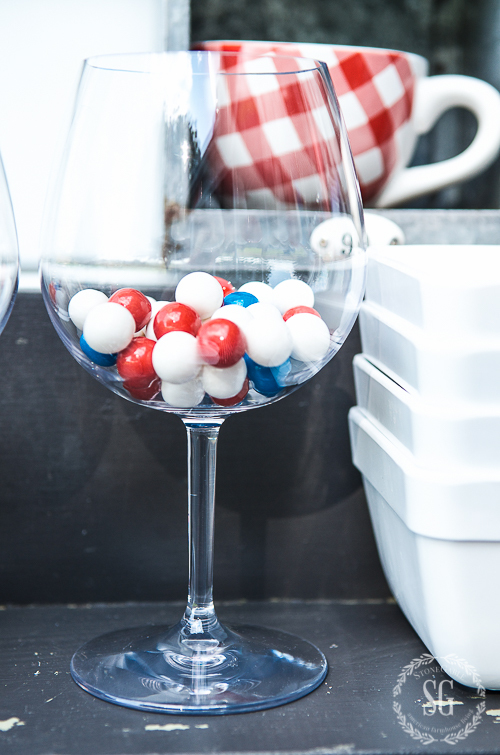 I have been using the Corelle dishes for outdoors and they can go in the dishwasher 🙂 Where did you find the blue and white drink dispenser? I would love to have one but I can’t seem to find one with a sturdy spout. This one looks very well made. Hi Wendy, I found the drink dispenser at our local Pottery Barn Outlet several years ago! Hi! I love what you have done with the plastic ware! 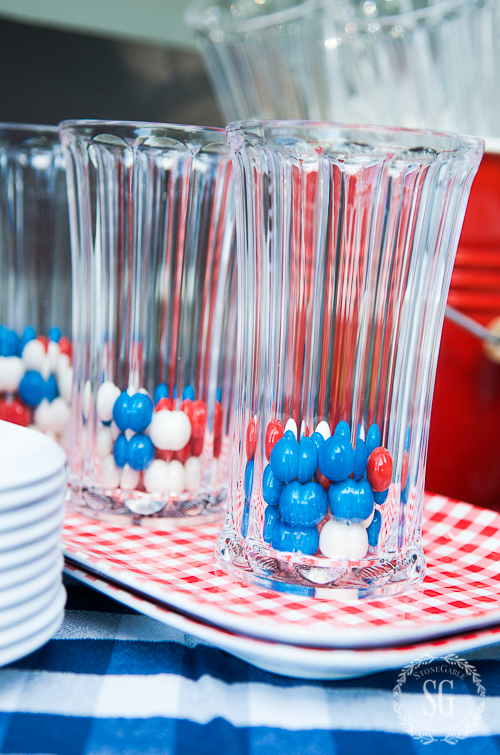 Where did you find the tall soda fountain glasses? I love them and they are exactly what I have been looking for! Thanks so much for sharing! You are amazing! Hi Kelly, I got them at HomeGoods! You mentioned that clean up is easy. Will the new dishes go in the dishwasher? I don’t ever put my plasticware in the dishwasher. But, Bobby does the dishes! Where did you find the checkered plates? Hi Loreal, the checked plates came from HomeGoods. They had so many adorable pieces of plasticware! Melamine has become so nice that it feels like lightweight pottery now. I’m totally smitten when I’m shopping with these beautiful pieces. I too have been a real dish girl for outdoor dining…. 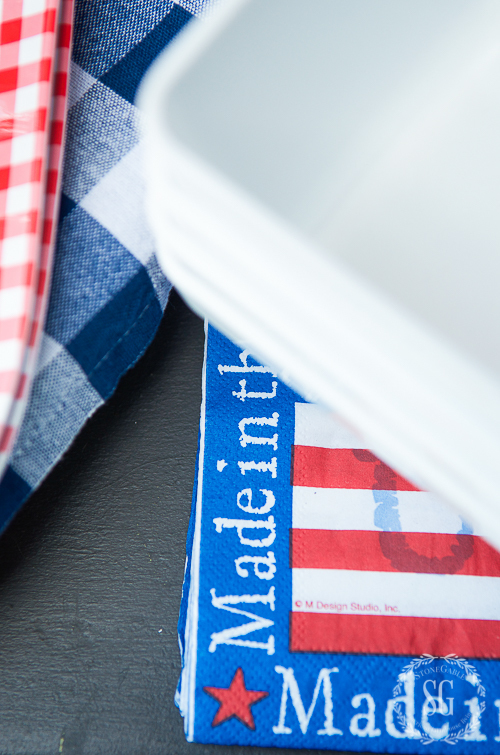 even for picnics in the park…. complete with cloth napkins. My reasons are partly practical and partly for the fun and good looks. You know me, Yvonne… I don’t want to be ordinary… so if skipping the paper makes me feel extraordinary… I’m all in. 😉 Your display looks amazing… Can’t wait to find out what you’ll be serving at that cute soiree. 😉 Have a blessed weekend, my friend! Super cute ideas! I’m ready for summer! So where did you find all this amazing plastic dinnerware? I haven’t had time to go shopping but if you point us in the right direction that would be wonderful! and by the way….you are such a inspiration. If I can find time to do a 1/4 of the things you do, I’ll be a happy camper! I am a red, white and blue girl so bring it on! Hi Marcia! I found most of these plastic dishes at HomeGoods! They had tons of amazing outdoor dining options. Check out Target too! Today is Will’s last day of school so we are gearing up for fun, summer entertaining at the beach. 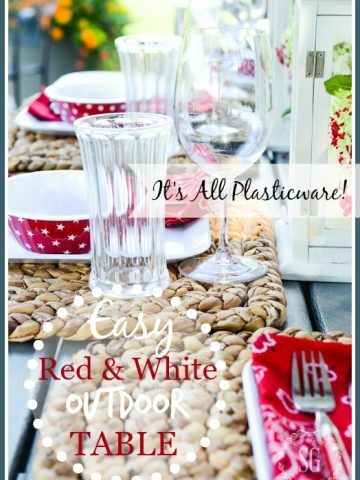 Love your ideas, Yvonne and the plastic ware is so cute! Happy weekend!